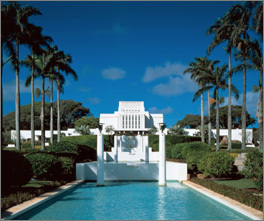 The Laie Hawaii Temple is the 5th operating temple of The Church of Jesus Christ of Latter-day Saints. The Laie Hawaii Temple marks a significant milestone in the Church because it the oldest still operating temple that was built outside of the state of Utah. The building of the temple was announced in October General Conference in 1915. The site had previously been chosen and dedicated on June 1, 1915 by President Joseph F. Smith who had served in Hawaii as a missionary and had a great love for the land and people. The site for the temple is on 11 acres of land that was originally part of a 6,000 acre plantation the Church bought in 1865 as a place of gathering for the Saints of the area. During construction, builders ran out of wood, which was a scarce commodity on the islands. Local members prayed for help in finishing their temple and not long after a ship was spotted off shore. The captain explained to them that his ship had run aground and that he needed to get rid of some of his cargo in order to get the ship out. The members offered to help and thereafter learned that the ship's cargo was none other than lumber. After the members had unloaded enough lumber that the ship could get out, they were told they could keep it. The lumber taken from the ship proved to be just the right amount needed to finish the temple. On November 27, 1919, President Heber J. Grant dedicated the temple, Joseph F. Smith having died the previous year. President Spencer W. Kimball rededicated it on June 13, 1978, after the temple was extensively remodeled. The design of the Laie Hawaii Temple was made to look like the ancient temples found in South America. President Joseph F. Smith stated many times that he wanted it to look like Solomon’s Temple from the scriptures. The exterior of the temple exhibits four large friezes that depict God’s dealings with man. The north frieze depicts the story of the Book of Mormon. The west frieze shows the people of the Old Testament, the New Testament. Events surrounding the great apostasy are depicted on the southern frieze of the temple, and the Restoration of the Church through Joseph Smith is shown on the east wall. It is one of the few LDS temples that does not have a tower or angel Moroni. The Laie Hawaii Temple has a total of 47,224 square feet, three ordinance rooms, and six sealing rooms. In January 2000, a second temple was built in Kona Hawaii. The Laie Temple closed in late 2008 for renovations, including extensive remodeling and refurbishing, including structural upgrades and mechanical upgrades. The temple also now meets codes for disabled patrons. After the renovations, an open house for the public was held from Friday, October 22, 2010, through Saturday, November 13, 2010, excluding Sundays. The temple was then formally dedicated in three sessions on Sunday, November 21, 2010, by President Thomas S. Monson. The temple opened for formal sessions and ordinances on Monday, November 22, 2010. A cultural celebration featuring music and dance was held in conjunction with the temple's rededication on November 20, 2010. The celebration was staged inside the Cannon Activities Center on the campus of Brigham Young University-Hawaii. Two thousand performers danced, sang and presented a visual display of island history and culture. Read more: KCSG Television - LDS Church President Thomas S Monson Rededicates Laie Hawaii Temple. This page was last edited on 24 January 2012, at 11:18.